We use as protective cover of office desk. We use for underlayment when writing and cutting things, but we use as mouse pad. This review is about item#41436622. The cutter mat was renewed for the first time in 30 years. It's from another manufacturer, but the cutter blade has become inseparable soon. This mat is great. It is good to be cut like a slip and have a blade. This review is about item#60523197. Used in cutting of leather material. When cutting leather, use the knife well sharpened. I had a crack on the floor because it was cut with the mat I was using before. With OLFA you can safely use a knife without penetrating it. Durability is outstanding. I tried repeating. I hope the price is cheaper a little more. This review is about item#41436613. Table protection for cut of cardboard etc. I serve as it is, but I care about where the mat is waving a bit. This review is about item#60523206. It is very convenient to use the front and back sides. This size mat is saved because it is not lining up in the shop. This cutter mat has good hardness and can use one that is easy to see because the color of the back and front is different. It is the same width as the one used before, but the height is a little big. This size is very convenient and easy to use. It is a standard product. There is not particularly inconvenience when using it. Scale of 1 cm, it is convenient because bold lines and numbers are attached every five centimeters, It is especially helpful when cutting long objects. I was looking for goods that ease of use and scratch are not noticeable.I was moderate hardness and it was good. 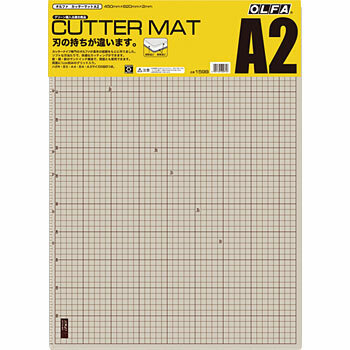 It is natural for Olfa's cutter mat to not hurt the cutting edge just for its hardness, but color is also easy to use with cream type gray. Although I used green items of other companies' products, Green felt like seemingly good for the eyes but I felt the lights were dark and the workability was not good. This product is designed with consideration to the color of the cream system, the dark brown system on the back and the color of the lighting and the thing to cut, so this product is easy to use in any environment. Until now I have not used Matt, so I began to use Matt and be able to break easily. Thin, it is 3 layers (hard material in the middle) and you can use both sides. Scale of 1 cm square, A4 size etc. is convenient. Slitter of the cutter is good and it can cut off smoothly. Compatibility with Olfa's rotary cutter was perfect. There are various sizes, and it is hard to get scratched even when cutting with a cutter. I will distribute it for students in a cutaway classroom. The table is black, the back is beige color-coded and it is convenient. However, it seems easy to use gray or green rather than black because there are many opportunities to put on black paper and cut. I like the hardness. Rather than a cutter stand, purchase as a convenient desk seat with a scale. Of course it is also used for cutter, but because it is easier to grab size feeling mainly for electronic work during photography. When thinking whether it is rubbery, it is smooth as it feels like a satin finish of PVC, so it is easy to handle. Olfa's goods, I think that they are all done well. Price is also reasonable and recommended. Usability is good. Even if you do not force strongly, it will cut. long lasting. Although it was harder than I thought, the blade of the cutter cuts in that amount, so it was good as it can cut without applying force when cutting paper etc.